Even though I love eating chicken with the skin-on, I don’t often buy it for meals. It’s been drilled into my head for years that eating healthy means buying skinless chicken. I guess that’s why I buy boneless, skinless chicken breasts like they are going out of style. Don’t get me wrong, I enjoy eating my boneless, skinless chicken breasts, but it shouldn’t come as a surprise that skin-on chicken is juicier, more tender and with loads of yummy flavour. 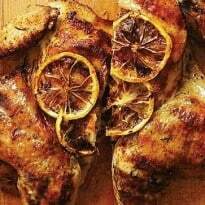 The reason skin-on chicken is juicier is because the skin traps the natural juices inside the meat as it cooks. Cook a chicken breast with skin and cook one without skin and you will be able to tell the difference between the two. Today I have an exciting health breakthrough to share with you about why chicken is really a Superfood. The Chicken Farmers of Canada have recently undertaken a nutrition study and made an important discovery that changed the way I cook my chicken. They learned that a skin-on cut of chicken can attain similar nutritional value as its skinless counterpart IF the skin is removed prior to consumption. What this means is that you cook your chicken with the skin on and then remove it before you eat it. This method allows the chicken to keep all those juices and flavour we know and love. Serving your chicken this way is essentially the same health-wise as serving a skinless cut of chicken! It’s all possible thanks to a process called “chicken osmosis”. This is the process where the fat in the meat is drawn into the skin and absorbed during cooking. Then, afterwards, when you removed the skin, you are also removing most of the fat with it! Did you also know that bone-in chicken contains significantly more zinc, Vitamin B and B12? Now you can take advantage of these extra health benefits without the extra fat and calories. You know what this means right? Now, I’ll be able to purchase the bone-in, skin-on cuts of chicken at the grocery store which are cheaper than the boneless, skinless chicken. Saving money is always good! Chicken Farmers of Canada has a post on their site called New Study Shows How to Cook Healthy Chicken with Skin On. I encourage you to check it out for more info about this important health breakthrough. It definitely changed the way I’ll be shopping and cooking my family’s chicken! If time is on your side today, feel free to check out my recipe for Slow Cooker Salsa Chicken and my post, Meet the Chicken Farmers of Canada. Of course, I had to test out this new found knowledge! 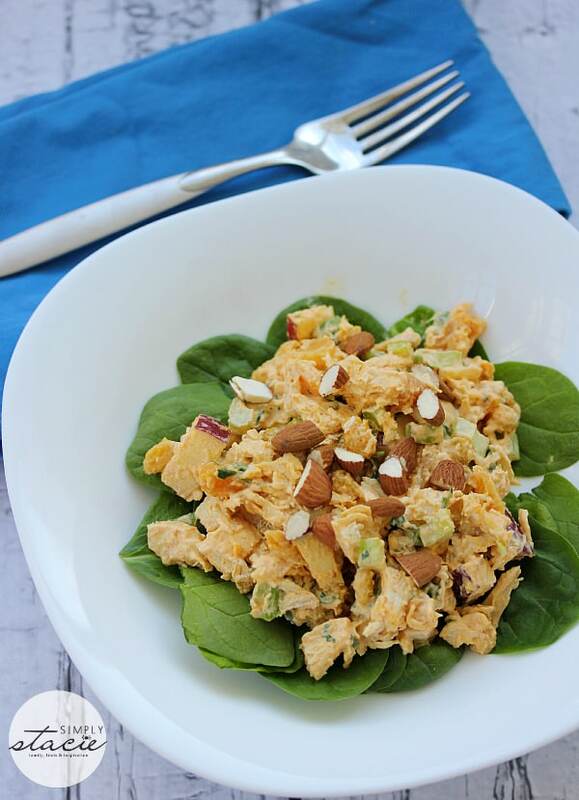 I made the absolute best chicken salad I’ve ever tasted: Famous Curried Chicken Salad. This is the only kind of chicken salad I ever want to eat. It was seriously that good! 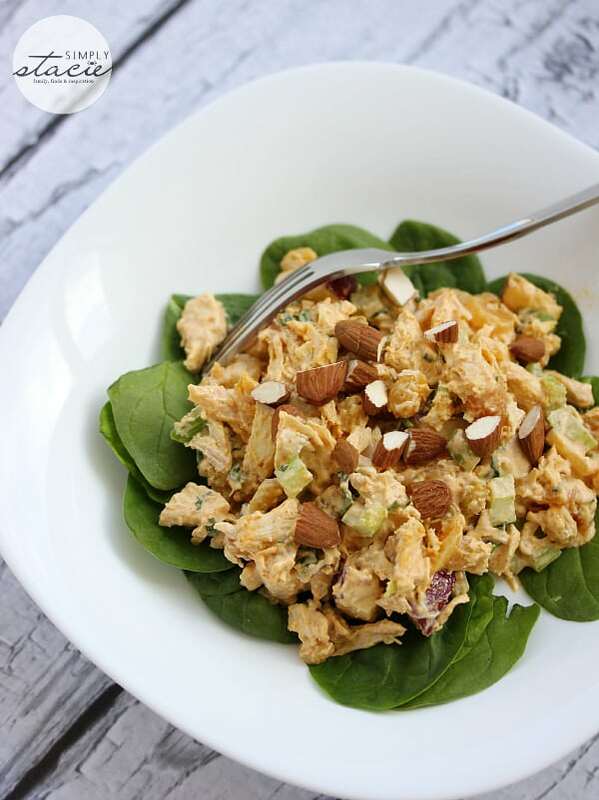 The BEST chicken salad you will ever taste! Put raisins in a bowl of boiling water to plump up. Set aside. Combine mayonnaise, sour cream, curry paste and salt in a large bowl. Blend together until no streaks of curry remain. Mix in chicken. Add apricots, celery and green onions to chicken mixture and stir together. Drain the raisins and mix into the chicken mixture. Add in apple and cilantro and mix to combine. Top with almonds. Serve on a bed of greens if desired. Fiesta Ground Chicken Hash browns look yummy. 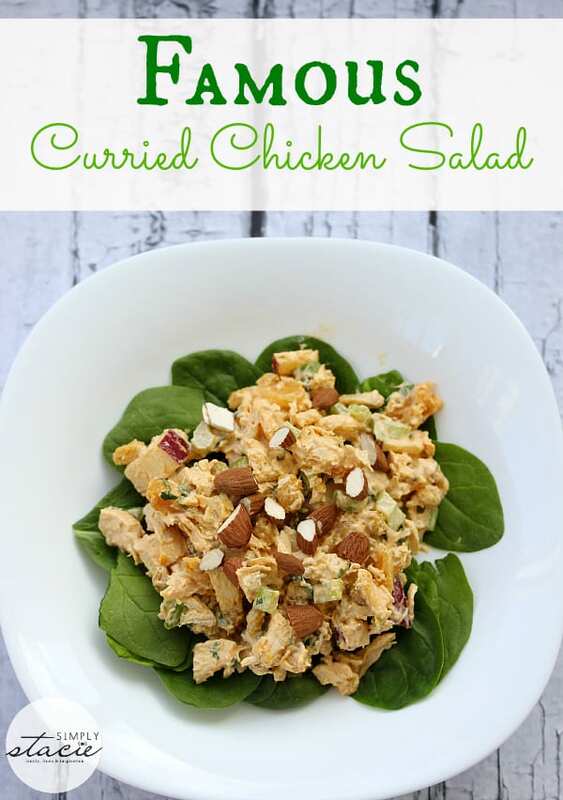 I want to try making Famous Curried Chicken Salad. I want to try Stir Fry Chicken with Baby Bok Choy & Peppers! Sounds delicious! I’d love to try the chicken curry in a hurry! It looks so good! The Glazed Chicken With Peaches & Red Pepper looks like something I’d try. I would love to try the Honey-Dijon Drumsticks! I want to try General Tso’s Chicken! the famous chicken curried salad just looks awesome! I would eat this any day for lunch! The Italian Chicken Pie With Fennel looks amazing!! 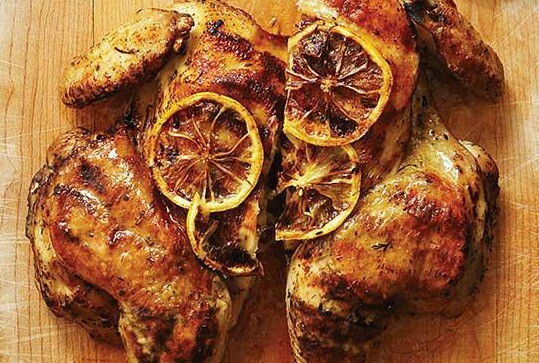 Really loving to try the best ever jerk chicken recipe, Mmmm! Glazed Chicken with Peaches & Red Pepper looks so good. I would like to try the General Tso’s Chicken recipe. I wan tot make the Chicken Enchiladas. I’d love to try the lime butter chicken, looks yummy! Grilled Tex Mex Chicken – Can’t wait to grill outside on the BBQ!